When Dr. Jackson Twesigye Kaguri lost his eldest brother, Mushabe to HIV/AIDS in the August of 1996, it was a terrible blow to the family in Nyakagyezi, Nyarutojo parish, Kambuga sub-county, Kanungu district in southwestern Uganda. Hitherto, Mushabe was the breadwinner of his family, and the one person his children looked up to for a better future. Before a year could elapse, Twesigye's elder sister also died of HIV/AIDS in May 1997. Living in the USA and working at Michigan State University, Twesigye was the family member in the best position to wipe the tears off the faces of the rest of family by looking after the orphans left by the brother and sister. This was a burden Twesigye was more than prepared to carry. He dutifully took over the care of his brother's and sister's children, paying for their tuition, rent, clothing them and ensuring that they fed well. Life seemed to return to normal for the Kaguri family. But each time Twesigye and his wife Dr. Beronda Montgomery visited Nyakagyezi from the USA, they always met an increasing number of other orphans in the village whose parents had died. The orphans had consequently dropped out of school due to lack of books, school uniform or just a pencil. Many old women in the village would ask Dr. Twesigye for money to take their kids back to school, buy uniform and the like. "When my wife and I visited my parents in April 2001, we decided not just to keep helping a few kids but help more of them through a primary school," Dr. Twesigye explains. That was the beginning of the birth of Nyaka Aids Orphans School in Nyakagyezi. Dr. Twesigye, together with his wife contacted some people in Uganda and agreed to start the Nyaka Aids Foundation, which was registered as a Non-Government Organization. The NGO worked hard to mobilize resources nationally and internationally to start the school. Smiles all round during meal time at Nyaka Aids Orphan School. "Our mission was to provide quality, free education and extracurricular activities, both formal and informal, to children who have been orphaned due to HIV/AIDS as a means of countering pervasive hunger, poverty, and systemic deprivation," Dr. Twesigye says. Nyaka Aids Orphans School was officially opened with 60 pupils on 2nd January 2003 with Primary Year 1 (P1) and Primary Year 2 (P2) classes, (30 pupils in Primary Year 1 and 30 in Primary Year 2). It has been growing with one class of 30 orphans being added every year. As of March 2007, the school had classes up to Primary Year six, with 180 orphans who would otherwise be out of school now getting free education and care. 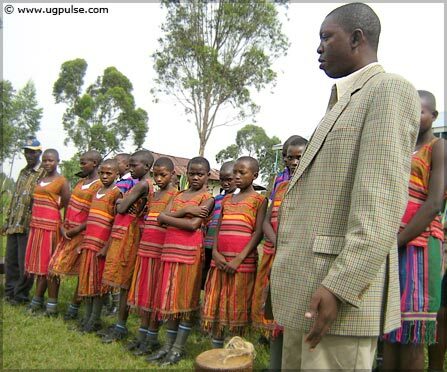 "We shall have seven classes in 2008 and expect to have the first Nyaka graduation at the end of 2008," says Abu-Baker Sempa, the national Coordinator of Nyaka Aids Foundation. This is the result of a family tragedy created by HIV/AIDS that led to concern by the affected, but turned into smiles and praises at Nyaka Aids Orphans School.According to the Uganda Aids Commission, Uganda has over 2million orphaned children, mainly as a result of HIV/AIDS, which has claimed about 1.5 million people in Uganda so far. Vastin Kyasimire, 13, who was studying at Nyakagyezi primary school in 2002, had dropped out in P.2, following the death of her father. She joined Nyaka in 2003 after the school opened. Kyasimire who is now in P.5 says she is happy to be studying at Nyaka and hopes to achieve her dream of becoming a teacher. When husbands die, many women are not able to look after the children, and in some cases, children are left to grannies. When Christine Mubangizi's husband, James Mubangizi, died in 2001, she was wondering what to do with education of their youngest child, Patience Amumpire. "I just knew how to grow beans and maize for us to eat. It was difficult to raise money for her school uniform and books. But Nyaka came to our rescue and she is now in Primary Year 3 (P3)," Mubangizi says. Vastina Night, in her fifties was forced to withdraw her children Ayebale Phiona and Herbert Mande from school when her husband Paul Kasizi died. Thanks to Nyaka Aids Foundation, the kids are now studying for free at Nyaka in P.3 and P.4 respectively. "The school has been very helpful. It is looking after our orphans, and also gives them food, uniform, shoes, books, health care, they are looking good," she told Ultimate Media. Aida Kikoko, 56, is looking after 3 orphaned grand children, but Nyaka managed to take on only one. "The school is limited to 30 pupils per class. Every year, we enroll only P1. So we can not get more than one kid from the same family to the same class when there are more than 100 applicants," says Israel Kikangi, the Head teacher of Nyaka. "For a child to be admitted to Nyaka, he/she has to have lost both parents or a father," adds Kikangi. The question is, however, why are these children not enrolling for free primary education under the Universal Primary Education (UPE) Programme, which the government of Uganda begun to implement in 1997? 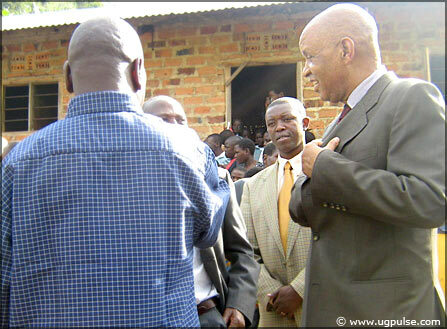 Local leaders on a visit to Nyaka AIDS Orphans' School. Dr. Twesigye says that although free primary school education exists, many rural pupils still struggle to buy books, school uniform and many cannot afford a single meal to sustain them throughout the school day. Moreover, Kikoko says that while Nyaka Aids Orphans School took on only one of her five orphans, there is a big difference between this child and those in UPE schools. "She is in better health, can read better, writes better despite the fact that I have to pay three thousand six hundred shillings (3,600/=) for stationery and building for the children on the UPE programme at Nyakagyezi and Namunye primary schools where the 4 study," Kikoko says. Evaristo Buhaburwa is the Chairman of Nyaka Guardian's Committee. "What is being done here at Nyaka is great and we appreciate. I would suffer to look after the orphaned children, since I can hardly afford to look after my own children," Buhaburwa says. Nyaka took over four orphans from his four different daughters who died. Buhaburwa who is also the Local Council II Chairman for the area urges guardians to encourage the donors and school administration to help by looking after the orphaned children properly. The Chairman of the School Management Committee, Habib Museka also says the guardians' state remains a major challenge. "It is difficult enough to take care of orphans as a school, but we have found we need to look after the guardians' material, social and emotional needs as well or else the kids we support will not enjoy the help. For example when we give school children mosquito nets, sometimes the guardians take the nets away to use them, leaving the kid to share with others," he says. This is why Nyaka has devised home visits to check on guardians, healthcare sensitization and treatment, as well as general advice on how to get out of poverty. "But to visit over 140 homes in say one term, you need enough transport and human resources," Museka says. But it is these visits that have enabled the guardians to trust the school, and indeed convince guardians (mothers) of some children at Nyaka to take an HIV test, together with their children. "With the help of Kambuga hospital, we mobilized the guardians and had them allow us to test the kids. 134 were tested, 3 were found HIV positive. One is on ARVs, the other two are taking septrin as we await doctor's guidance," Kikangi says. Nyaka's School Nurse, Dora Museka says that while they have a commendable HIV/AIDS sensitization and healthcare outreach initiative, the school is still short on having all medicine required to appropriately look after the kids and their guardians. Ready to sound the drum against AIDS; The Anti-AIDS club at Nyaka School. The school also does HIV/AID sensitization through the Anti Aids Club. Through music and drama especially in schools, churches, and at public functions, the club moves around the community sensitizing people about how HIV is spread, how it can be avoided. In addition, Nyaka Aids Foundation came up with a community garden project, where they plant bananas, tomatoes and other crop varieties, with the garden acting as a demonstration farm for the community, especially for new species. The garden also provides the pupils of Nyaka with practical agricultural lessons. "Apart from using the garden as a source of food for the pupils and teachers, we also give these good seed varieties to neighbours who plant them to promote nutrition and eliminate poverty in their families," says Milton Kwihuma, Nyaka's teacher in charge of agriculture. 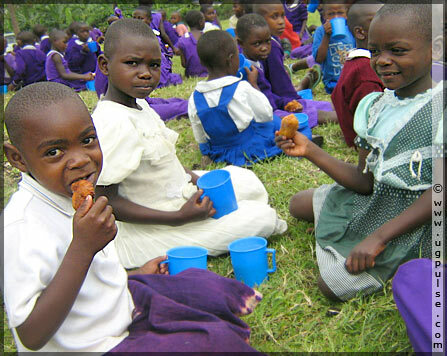 The school provides breakfast and lunch to pupils and teachers. It is through this gardening project that the guardians of the orphans are able to contribute by providing a day's work each month in the school garden. Nyaka School is looking after our grand children properly and gives them everything, so we decided to come to work at the school. We started by working to clear and clean the compound and now we work in the garden so that we also contribute," says Christine Mubangizi, the Vice Chairperson of Nyaka School guardians' association. Arinitwe Kamomo, a member of Nyaka School management committee says "It is a good school. We come here to plant food to help the school help our orphans" Arinaitwe, who is a subsistence farmer looks after his two brothers, Bainemogisha Isidol who schools at Nyaka and Sensio Mucunguzi also in P3 at Nyaka. 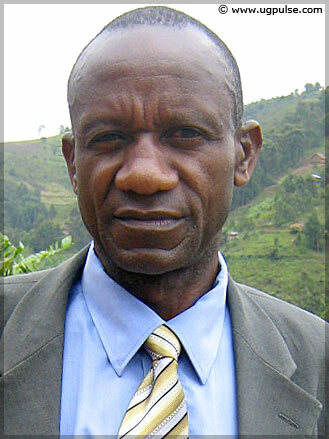 Israel Kikangi, Head Teacher, Nyaka AIDS Orphans' School. Arinitwe says that while Nyaka is doing a commendable job, the school would do even better if it got funds to establish a boarding section so that boarding pupils can be accommodated, "Some kids come from very far. It is difficult for them to commute especially during rainy season," he says. "My grand children come from Nyakatunguru where we live. It is more than 8kms from Nyaka School. We wake them up early before 6am but they still arrive at school late. If boarding facilities are built, it will be good for their safety as well," say Jolly Kikoko, one of the Guardians of Nyaka Aids Orphans' School. Also, some of the guardians are above 70 and lack basics like food since they can no longer work on their own, thereby requiring help if the kids are to go to school. About a kilometer from the school lives a frail looking Mzee Yustus Tibubaho, in his 80s. Mzee Tibubaho lives with five grand children from his daughters who died. Only one, Daphne Akampurira was taken over by Nyaka Aids Orphans School. He says he is sick too, has neither money, nor resources to sell. "I'm also sick. I know I will die and leave them. I wish the school was able to take care of all five children," Tibubaho says. He says Nyaka has reasonably risen up to the challenge of HIV/AIDS orphans in the area and it would be comforting if they were sure the kids will get post primary education. Sempa says the school is planning a vocational section where some kids will learn hands-on tasks like sewing, while others will be helped to continue into traditional secondary education. Dr. Twesigye says they are planning to establish a scholarship programme for kids continuing into secondary, high schools and university or other tertiary institutions and establish their services in another poor rural community by 2009. This they are already achieving, following the launch of Kutamba Aids Orphans School in Nyakisenyi, Rukungiri District, Uganda on March 4th, 2007. The school started in February 2007 with 60 pupils (30 in P.1 and 30 in P.2) and was officially launched by Prof. Mondo Kagonyera, the Deputy Director of the National Social Security Fund. Like with Nyaka School, one class of 30 orphans will be added annually, provided Nyaka Aids Foundation is able to mobilize for the money. 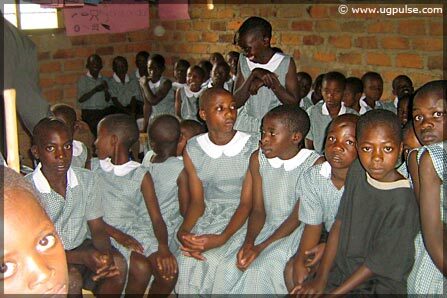 Eager orphans attend classes at Kutamba Aids Orphans School in Nyakisenyi. "We also want to train our teachers and staff in dealing with the trauma, physical, social, emotional and spiritual needs of the students," Twesigye says. When Ultimate Media visited Nyaka School in early March 2007, the Rotary Club of Springfield, Pennsylvania, USA had sent two social workers, Barbara and Clare to train the teachers on how to deal with the emotional and psychological needs of the children, given that they have lost both or one parent and live mostly in deprivation. This psychosocial training will benefit pupils like Bruno Ankunda, 13, who is in Primary School Year 4 (P4). According to some teachers at Nyaka, Bruno is too reserved and resigned in class, thoughtful for most of the most time. This is blamed for his poor performance in class. Bruno lost his father in 1997, only for the mother to follow a few years later, leaving Bruno and his brother, now 14 to cater for themselves, as they do not have any surviving elder relative. Bruno and his brother stay alone in their late mother's house in Katungo village, Kambuga, and have endured loneliness, besides thieves threatening them at night. "Sometimes we eat matooke (plantains) without salt," Bruno says. Nyaka is however giving Bruno all the hope he needs, the reason he is sure he will fulfill his dream of becoming a doctor. "I like Nyaka School because they give us food and teach us well," Bruno says in an interview. "We have achieved a lot in education. The kids are happy. We have seen them grow from sorrow to happiness. They are looking forward to a better future and are not loosing hope as a result of losing their parents," Sempa says. "We expect much from that school. We think we shall benefit much from that school. It is the only school of its nature in the district where orphans study for free," says Hajji Barii Ayub, the LC3 Chairperson for Kambuga Sub-county. He says the Local Government only helps the school by way of offering moral support and mobilizing the community, because of the Government's limited funds. Doing their part; Guardians of orphans at Nyaka Aids School work at the school garden. 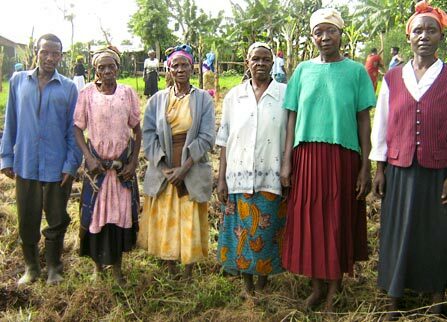 As part of the school project, Nyaka Aids Foundation has started the Mukaka Initiative to organize the grand parents who are looking after the orphans. "Most orphans are in the hands of hapless grandmothers, who are themselves poor with no property and can't afford meals sometimes. The Mukaka Initiative is educating them on how to become self sustaining through income generating activities and how to take care of the children better," says Freda Byaburakira, the head of the Mukaka Initiative. "We also want to teach the orphans how to survive through their own efforts by working hard, worshipping God and helping improve sanitation in the school and in homes," she adds. All this is possible through the support of the Stephen Lewis Foundation, Jackson Twesigye and his family as well as members of the international Board of Nyaka, Rotary clubs and individual donors. "The friends of Nyaka recently gave a van (omnibus) to transport the anti-Aids group on their anti-AIDS sensitization missions to different places," Sempa says. What Nyaka is giving may seem little at first, but is great for the orphans since no such assistance is available from the Ugandan government. Dr. Twesigye says many of the people who have helped Nyaka Aids Orphans School are not big donors, but individuals who give as little as US$10 (about 17,000 Uganda shillings) which makes a big difference in an orphan's life. You too can. Sempa calls upon the Ugandan government to continue encouraging initiatives like Nyaka by waiving some taxes from some materials the Non-Governmental Organisations (NGOs) use. "The UPE programme should have a special concern for orphans. Extra charges like stationery and building should be waived for orphans just so they can continue to access education under UPE. The government can also organize community centers to help orphans without any parent or people to look after them," Sempa appeals.